Paul Connett made many unsupported claims in his presentation against community water fluoridation (CWF) to Denver Water. Here I debunk a claim where he rejects most scientific studies on the cost-effectiveness of CWF. Previous research showing the cost effectiveness of community water fluoridation (CWF) has been made obsolete by a single new paper. Connett has cherry-picked just one paper, refused to say why and, by implication, denigrated any other research results. And there are quite a few studies around. Campain, A. C., Mariño, R. J., Wright, F. A. C., Harrison, D., Bailey, D. L., & Morgan, M. V. (2010). The impact of changing dental needs on cost savings from fluoridation. Australian Dental Journal, 55(1), 37–44. Griffin, S. O., Jones, K., & Tomar, S. L. (2001). An Economic Evaluation of Community Water Fluoridation. Journal of Public Health Dentistry, 61(2), 78–86. O’Connell, J. M., Brunson, D., Anselmo, T., & Sullivan, P. W. (2005). Costs and savings associated with community water fluoridation programs in Colorado. Preventing Chronic Disease, 2 Spec no(November), A06. Of course, the actual figures vary from study to study, and various figures are used by health authorities. But generally CWF is found cost-effective over a large spectrum of water treatment plant sizes and social situation. Ko, L., & Thiessen, K. M. (2014). A critique of recent economic evaluations of community water fluoridation. International Journal of Occupational and Environmental Health, 37(1), 91–120. This is a very long paper which might impress the uninitiated. To give it credit, it does make lengthy critiques of previous studies on cost effectiveness. But it has a huge flaw – its treatment of the cost of dental fluorosis. The prevalence of “cosmetic” dental fluorosis may be about 10% but this cannot be attributed to CWF as non-fluoridated areas have a similar prevalence. For example, in the recent Cochrane estimates show “cosmetic” dental fluorosis was about 12% in fluoridated areas but 10% in non-fluoridated areas (see Cochrane fluoridation review. III: Misleading section on dental fluorosis).This is a common, probably intentional, mistake made by anti-fluoride campaigners – to attribute the whole prevalence to CWF and ignore the prevalence in non-fluoridated areas. This highly exaggerates the small effect of CWF on the prevalence of “cosmetic” dental fluorosis – which in any case does not need treatment. “Cosmetic” dental fluorosis is often considered positively by children and parents. The small numbers of children with moderate and severe dental fluorosis (due to high natural fluoride levels, industrial contamination or excessive consumption of fluoridated toothpaste) is irrelevant as CWF does not cause these forms. Their prevalence is not influenced by CWF. 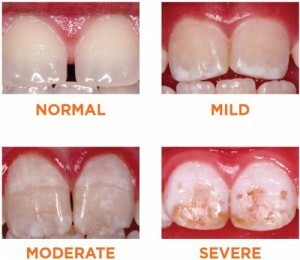 They attribute all the moderate and severe forms of dental fluorosis to CWF. Despite the fact that research shows this is not caused by CWF and their prevalence would be the same in non-fluoridated areas! The authors’ major effect – which they rely on to reduce the estimated benefits of CWF – is not caused by CWF. The Ko & Theissen (2014) paper is one of a list of papers anti-fluoridation propagandists have come to rely on in their claims that the science is opposed to CWF. In effect, this means they exclude, or downplay, the majority of research reports on the subject – treating them like the former Index Librorum Prohibitorum, or “Index of Forbidden Books,” an official list of books which Catholics were not permitted to read. The Ko & Theissen (2014) paper is firmly on the list of the approved studies for the anti-fluoride faithful. A few others are Peckham & Awofeso (2014), Peckham et al., (2015), Sauerheber (2013) and, of course, Choi et al., (2012) and Grandjean & Landrigan (2014). You will see these papers cited and linked to on many anti-fluoride social media posts – as if they were gospel – while all other studies are ignored. These papers make claims that contradict the findings of many other studies. They are all oriented towards an anti-fluoridation bias. And most of them are written by well-known anti-fluoride activists or scientists. In effect, by considering and using studies from their own approved list and ignoring or denigrating studies that don’t fit their biases, they are operating in an alternative reality. A reality which may be more comfortable for them – but a reality which exposes their scientific weaknesses. I know Paul Connett is now a lost cause – he will continue to cite these papers from his approved list and make these claims no matter how many times they are debunked. But, in the hope of perhaps helping others who are susceptible to his claims, here are some lessons from this exercise. If anti-fluoride activists wish to support their claims by citing scientific studies they should take them on board. Lesson 1: Make an intelligent assessment of all the relevant papers – don’t uncritically rely on just one. Lesson 2: Don’t just accept the findings of each paper – interpret the results critically and intelligently. How else can one make a sensible choice of relevant research and draw the best conclusions. Lesson 3: Beware of occupying an alternative reality where credence is given only to your own mates and everyone else is disparaged. That amounts to wearing blinkers and is a sure way of coming to incorrect conclusions. It also means your conclusions have a flimsy basis and you are easily exposed. Lessons for everyone susceptible to confirmation bias.